We have a great range of deals for new students in Islington learning to drive with Book Learn Pass. If it is your first time with us, you can take advantage of our low priced driving lessons. Further discounts are available on both manual and automatic driving lessons in Islington. 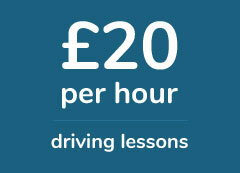 Book 10 driving lessons or more for excellent course prices with a professional driving instructor in Islington today. We want you to find it easy to pay for your driivng lessons. Learning to drive comes with a significant financial commitment and because of this, we have reduced the price of all our driving courses. Our low-cost driving tuition will help you pass your driving test, while saving you money at the same time. Book 10 driving lessons or more for an additional discount. if you need your driving license at short notice, choose from one of our intensive driving courses in Islington. Our intensive lessons are designed to help you cover the driving syllabus in just a few weeks, while ensuring you drive in a careful and considered way. Choose from one of the crash courses listed above, if you need to pass your driving test in a hurry. Book affordable driving lessons in Islington with Book Learn Pass and save money while you learn to drive. Our driving lessons are competitively priced and with further discounts available for block bookings, we’re an Islington based driving school offering great value for money. We offer a wide range of driving courses in Islington and learner drivers of all experience levels can learn to drive with us. Our driving instructors have worked in Islington for a number of years and they have great local knowledge. You will be taught how to drive in a comprehensive and robust way, developing you into a well rounded driver. We offer driving lessons throughout N1 and beyond and we can help you pass your driving test without spending a fortune. We aim to have your driving lessons booked within minutes. Our customer service team and booking agents work 7 days a week, from Monday to Sunday. A member of our team will always be on hand to assist you with any issues or queries you may have. We have a number of quick and easy ways you can use to contact us and however you choose to get in touch, we will respond to you in an efficient and timely manner. Once your driivng lessons have been arranged, you will receive email confirmation of your appointment along with your start date and reference number. If you would like to book driving lessons in Islington over the phone, you can call our booking telephone line on 07597471607. Our phone lines are open from 9:00am to 8:00pm and all calls will be answered by a friendly member of our booking team. We also have a really easy to use call back system, for anyone who would like to book their driving lessons through the website. To get started, fill in the contact form and once your details are processed, we will call you back within a short period of time. We understand not all learner drivers can call mobile numbers free of charge, so our call back system is a way to avoid unnecessary charges. Within the followup call, we will organise a location, time and start date for your driving course. Learner drivers who would prefer to get in touch with us by email, are also free to do so. You can book your driving course by emailing bookings@booklearnpass.co.uk. In order for us to process your enquiry quickly, in your email please include your name, location, availability, course type and any specific preferences you may have. The more information we have, the quicker we can assign you a driving instructor and get you behind the wheel. Once we receive your email, we will respond with a range of course start dates, based on the information provided. We’ve made paying for your driving lessons simple, quick and easy to do. You have a range of options to choose from, allowing you to pick a payment method which best suits your needs. A number of learner drivers prefer to pay for their driving lessons in Islington over the phone. For those who would like to do the same, please ring our central booking office on 07597471607 and a booking agent will arrange the start of your driving course. After agreeing a start date and paying over the phone, you will receive email confirmation of your booking and a driving course reference number. If you would like to pay for your driving lessons online, we also have this option available. Using Paypal you can pay for you driving lessons with an Amex, American Express, Visa, MasterCard or your Paypal account. Payments made through Paypal are secure and backed by their buyer guarantee. If it is more convenient for you to pay at the start of your driving lesson, there are two options available. You can either pay by cash or make a card payment. Your driving instructor will accept both, as all driving instructors in Islington are equipped with a mobile payment terminal. Once payment is received, you will be given a receipt which includes the time payment was made, the amount and a payment reference number. As of mid 2016, the Royal Bourough of Islington had a population of 232,900, the 71st largest in the country. It’s population is 47.7% White British, 16.4% Other White, 6.1% Black African, 3.9% White Irish and 3.9% Black Caribbean. The borough has excellent transport links with Kings Cross and Highbury and Islington stations two of the busiest in the capital. The borough is divided up into 16 wards and each ward has 3 councillors representing it. Islington Town Hall can be found on the intersection of Upper Street and Richmond Grove. The area has a number of major cultural attractions and places to visit. These include the Emirates Stadium – home to Arsenal FC – theaters such as the Hen and Chickens and the London Canal Museum which is located in Kings Cross. Are we the cheapest driving school in Islington? Our driving lessons are affordable, however our aim is not to offer the cheapest driving lessons in the area, but to offer the highest standard of teaching to all our learner drivers. Will we learn to drive with a sat nav? The new driving test introduced on the 04/12/2017 requires those taking their test to drive independently for 20 minutes, while following a sat nav. In order to prepare learner drivers in Islington for this, driving lessons will include independent practice sessions with a sat nav once the student has reached an acceptable standard of driving. Can I re-schedule my driving lessons? If you have booked driving lessons in Islington and wish to reschedule, you can do at any time without being charged, as long as you give us at least 48 hours notice. If you cancel within 48hrs of your lessons start time, you will be charged the cost of the actual driving lesson. Are Driving Lessons 1 on 1? All our driving lessons are conducted on a one to one basis. Some driving schools in Islington conduct lessons with other students in the car, but this is something we do not do. All our driving lessons are conducted on a one on one basis, and we believe this creates the best learning environment for our students. How much does it cost to hire a car for my driving test? It costs £65 to book a car with Book Learn Pass on the day of your driving test. This cost includes an hours lesson before the start of the your driving test.